Watermelon Romper https://www.review-australia.com/au/watermelon-romper-multi/RE19DR369.RECRM010.html Take a tutti frutti twist into summer with the gorgeous Watermelon Romper. 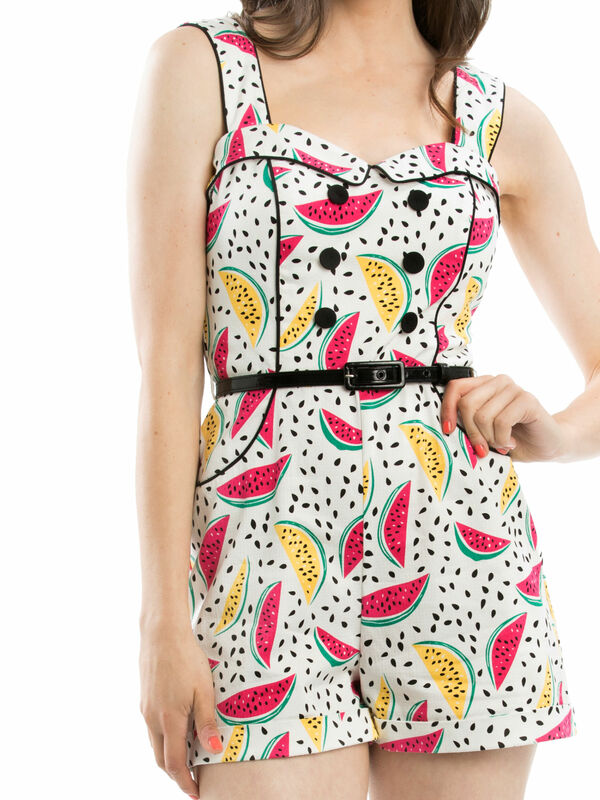 A short and sweet favourite, this watermelon print romper adds a modern vintage feel to your collection. The playful style sports relaxed flare shorts, a sweetheart neckline and black contrast buttons and piping. Watermelon Romper is rated 4.8 out of 5 by 18. Rated 5 out of 5 by Justine88 from Comfortable yet a little bit cheeky Purchased a few weeks ago, this was perfectly timed to coincide with the heatwave that hit Sydney! A comfortable and practical playsuit yet one that is super fun and perfect for the summer weather. This is a sunshiney outfit that I adore wearing. Sandles dress it down and heels dress it up. A multi-purpose outfit is always handy. Love the fruit pattern too. Rated 5 out of 5 by Katja from Cotton lined Bought this lovely romper for summer as noticed it is cotton lined. Love the neckline, was not sure about the colours, but it looks better in person than on the photo. A nice change from floral fabrics also. Ordered my usual size 10, but I do think it is a bit tighter fit than usual. Feels great on. Rated 5 out of 5 by Rails55 from Great fit Bought this last week. Wore it yesterday and it is so comfortable and looks great with the Martha sneakers. So many different belt colours will match the lovely bright colours in the pattern. Leg length is perfect. Rated 4 out of 5 by Lanakitty from Lovely play suit with cute print! Very cute play suit. I had to purchase the size 4 online due to reviews cuts now being extremely generous. In doing so the length only just fits my 5’4” body. It is also still quite hot due to the lining. Rated 5 out of 5 by Dressed in review from So comfortable. On high summer rotation I have the My favourite romper, which is the exact same cut. so I knew I would love this. I have received so many comments on it when I wear either of them. So cool because there is no lining below. Rated 4 out of 5 by ID80 from Great playsuit, but it needs pockets! Love the happy print, perfect for Summer. I wish it had pockets though, as it would have been perfect. It fits well and true to size for me, cotton lining is a bonus too.